Comments: One of the first live events I saw at KOTV, after I was hired in June of 1957, was "Live Wrestling." At that time, an elevated ring was set up in the North end of the studio. There were a few rows of metal chairs set up around the ring. There was an area along the west wall that served as a dressing room. It was only about five feet wide and ran almost the length of the studio. This is where the wrestlers would plan out their routines. I can't remember any of the wrestlers' names except for Danny Hodge. There was a fellow who referred to himself in interviews as "A Cadillac and diamond ring man." It was all pretty primitive. I do remember that they couldn't do the routine where they get up on the ropes and dive off on someone, because...at that height, they would be up in the lights; or, the cameras (B&W) would have to shoot into the light and that was a BIG no-no. I can't even remember how long that lasted. I don't think KOTV carried it very long. Danny Hodge and other pro wrestlers can be seen on the Rasslin' Page. Skandar Akbar was recently mentioned in the Tulsa World's Then & Now feature. Comments: Still love the site... gets better and better... a trip and fall down memory lane... thanks. Another "social club": "Ramblers" at Central HS in the 50s. Another Tulsa pro wrestler: Angelo Savoldi. They traveled on a circuit. Angelo was a bad guy in Tulsa, but the hero guy when they were back east (somewhere in PA I think, where there were a lot more Italians). The Savoldis and several other pro wrestling families lived down the street (Mario Savoldi was a friend of mine from Osage Elementary School days). I remember going down the street to watch the wrestlers practice their routines. They had a whole apartment fitted out for practice, floor and wall pads. My dad got tickets to the big "Baby's Milk Fund" benefit matches every year at the Fairgrounds Coliseum, and he and I would go. He would tell my mom "...because it's for charity !" Topic: "Here's to the Fair! The Tulsa State Fair!!!" Comments: Thank you, Brer Ransom, for the Fair photo coverage! The "Bible Bowl" was a kiddie quiz show produced at KJRH in the late 70s. Local kids competed on teams of "Bible Boys" or "Gospel Girls". Several people have have written in about it over the years. I found this video on YouTube. I'm not sure this is the Tulsa version of the show, but I am told by a 1977 participant that the kids' T-shirts looked like these. A robot was involved in the proceedings somehow, but it wasn't Oom-A-Gog, coming out of retirement. I can only find two of the B girl photos in the Beryl Ford Collection. Perhaps they were heralding the coming of Beef Baloney to Tulsa TV some 40 years in the future. (Later) I feel pretty sure the letters didn't stand for "Bible Bowl" (see item just above). Comments: I've noticed that quite a few people who frequent this site worked in radio at T.U. in the late 50s and also have participated in the Tulsa Easter Pageant and have worked with Tulsa Opera. A few of your names seem familiar and I believe you may have known my mother, Barbara Jean Brown - Fusselman. Barbara passed away on August 4, 2008. She lived in Tulsa from 1935-1989. She moved to Seattle, Washington in 1989 and lived there until her passing this August. She and her good friend, Gene Lyon, worked in radio at T.U. in the late 1950s and were both very active in the Tulsa Easter Pageant. Mom was involved with TV, theater, and radio in Tulsa for many years, and some of the best memories of her life were built there. Comments: You are correct...It is Moonlight Serenade by Glenn Miller! Thanks for the reminder! As to the Gaslight - I have lots of experience with them in the 70s and 80s. Considering how many bars in town would serve a mixed drink without a BYOL (if you knew the right place or the right owner), Gaslight really was one of the better behaved. Not much liquor 'by the wink'. Food was always good, if not great - and lots of good local folks with decent acting. I have good memories there....too bad lots of these types of entertainment are now gone! Speaking of pool - anyone ever get in a chance pool game down around Brookside with Gailard Sartain (or should I say G.Ailard S. Artain), or any of the old cronies from the Mazeppa hour. What a great time to grow up in Tulsa! Comments: Brian, I think the song you are talking about is "Moonlight Serenade", indeed by Glenn Miller. I can be no help with the "B Girl" mystery, but does anyone know about the "Gaslite Club"? Was this a liquor-by-the-wink club or a theater group of some kind? The Spotlight Theatre group, the name and logo seem familiar. I also think the pool shot was taken at the Ramada Inn circa: early to mid 60s, and why is that woman staring at me? The only thing I thought was good at the Fair was the destruction derby, to a kid, it just did not get better than that. Comments: When KRMG used to end their programming for the day - I think about 10 or 11pm (in the 1960s), they played a song from a big band - Glenn Miller, Benny Goodman, anyway - I can't find it, and the info escapes me. My father has Alzheimer's, and doesn't remember much. However, he listened to KRMG every day, and we this played most every evening in our home. He was humming the song (amazing), and I want to find the track for him, and some other big-band music. HELP! Does anyone know which song I am speaking of? Thanks for the help. Brian, there are several video sign-offs on the Sign-offs page. Roy Byram, who was a broadcast engineer at KOTV from 1970-1974, told us: "'Sunrise Serenade' was for sign-on and 'Moonlight Serenade' was sign-off. Played the cart too many times for both shifts." Jeff H (just above) believes KRMG used the same sign-off. Glenn Miller - Greatest Hits at Amazon has both tunes. The Tulsa State Fair is now underway! I'm sending this one out to...Aieeeee! Comments: I don't know what that B stands for but whatever it is, you know it can't be bad. The webmaster's recent obsession with Strangelovian associations is covered on TVparty's blog today (about halfway down the page). Comments: I believe that the "B" is a hint to the photographer and stands for "Bad Angle." Jeff MacKay, a Tulsa actor seen in "Baa Baa Black Sheep" and "Magnum P.I. ", passed away last month. Read about him: "Tulsan pursued a career in TV, theater". New coffee house near TU: "The Collective has soul". Menu items are named for Tulsa lore of the past and present, such as the Golden Driller, Zingo, and the Camelot. Comments: Maybe it stands for "biscuits and gravy"? Comments: I met that kid, Tom Hanford at Hale my first day of 10th grade. He was already one of the best guitar players in Tulsa at that time. Said he collected Beatle records. I asked what he had and he said "everything." Normally a kid that age would be making that up. He wasn't kidding. Heck of a guitar player then and now. Topic: UHF-"Rob Bowe" not pictured here.. Comments: Sorry, Rob Bowe-the guy in the picture (captioned "The Citizens of Tulsa, OK, find Rob Bowe w/ cursor) w/the moustache, ponytail, grey shirt and blurred right arm is actually ME. Standing immediately to my right is my dear departed friend Tom Keith (in the light green shirt w/ glasses) whose association with Clu Gulager got us on as extras. Tom and I can also be seen at end of movie as "Big Louie's" car pulls up to collect the money, and in the immediate background when Al presents "Stanley" w/ his trophy. Sorry if you thought for years this was you, but I still have not only a copy of the Polaroid of my "audition" in that shirt but still have the actual shirt! (also a "bootleg" video of rehearsals and outtakes from Stunts Unlimited, who arranged the stunts---the owner's son was the "fire hose boy"). Got that corrected, Tom, thanks. See stuntman Bob and son Adam Maras (Bob is Yankee great Roger Maris' cousin) on the "UHF" - Tulsa connections page. I just saw Tom playing some great guitar and singing in Brady O at Sunset Bar & Grill last week with my brother Alan, pix of which you can see in the Photo/video briefcase under Flickr. YouTube of Brady O in GB 270. Also listen to that incredible vocal by Terry Cooper. I searched the Beryl Ford collection to see if I could find a photo of Beverly's pool. 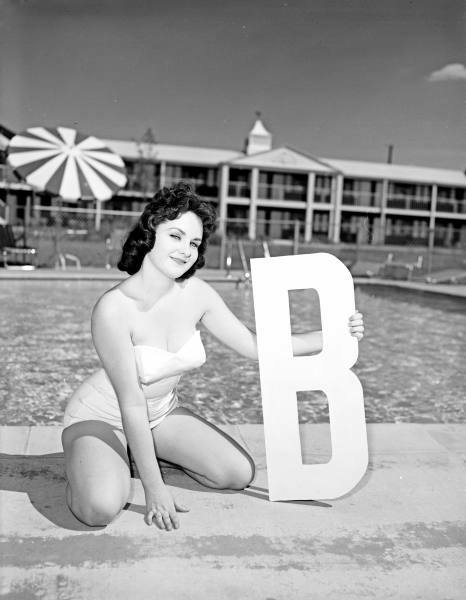 I failed, but I did find this photo of a model sitting beside a motel pool holding up a "B". The Gaslite Club "B" girl was shown on some flimsy pretext in a previous GroupBlog. So, does anyone know what the "B" was all about? 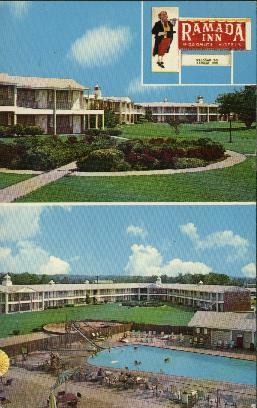 Location appears to be at the Tulsa Ramada Inn; compare postcard below. Comments: I sure remember outings to Beverly's Pool as a youngster in the late 50s - early 60s. No one else in my family is able to recall Beverly's, but I remember it being a nice clean uncrowded neighborhood pool. I've wracked my brain for years trying to place exactly where it was. Seems to me if you stand in the theater parking lot (north side of what will always be Southroads Mall to me), the pool was a stone's throw to the north. There was another pool on the southeast side of what used to be Southland. Dutch's was loads of fun too. It was the happening place for preteens and teens. Up until 15 years ago or so there were remnants of concrete picnic tables and pads. Now it has become home to a church (? ), parking lot and gardens. Comments: For those who care, the aircraft shown in the 1960s version of "High Flight" is a Lockheed F-104 Starfighter, a spectacular but ultimately disappointing U.S. Air Force jet fighter. The F-104 was designed after U.S. pilots in the Korean War complained about how the lightweight MiG-15 seemed to have better performance than their F-86 Sabres. Pushed by Lockheed as a "missile with a man in it," the F-104 was intended to be very small and lightweight with a concentration on speed above all else. The F-104 certainly achieved its initial goal--it was the first aircraft that could cruise at Mach 2. It also had an astounding climb rate--but it handled like a "milk truck," according to its pilots. Its tiny size meant it had very short range and limited weapons, and its revolutionary design meant the F-104 required an inordinate amount of maintenance. Although its exotic appearance was popular with both pilots and public, the F-104 was tricky to fly and far too many were lost in crashes. The U.S. Air Force operated the F-104 for only nine years (1958 to 1967), but the Air National Guard kept the plane for eight more. Also, the F-104 proved somewhat popular with other nations, particularly West Germany, Italy, and Canada, who built many of their own and operated them for quite a few years. Even so, the West German Luftwaffe was so plagued by F-104 crashes that a German joke held that the best way to get an F-104 was to buy a patch of land and wait. For those who may not know, the famous poem "High Flight" was written by Royal Canadian Air Force pilot John Gillespie Magee, Jr., in 1941, a few months before he was killed when his Spitfire collided with another plane over England. Comments: Does anyone remember a swimming pool on the southeast corner of 41st and Yale? A friend has told me about this, but I can't remember anything before Southland. She said the pool was owned by the Dutch family who later owned Dutch's Party Barn. She's not sure of the correct of the name. We were just wondering if anyone remembers either of those places. Comments: I was just surfing the net and was trying to remember exactly where KTOW was in Sand Springs. I lived in Tulsa and was the morning man and would drive through the oil refineries on the way to the station. Every morning I'd try to hold my breath, but about halfway there I'd begin to gag on the smell. Anyway as I remember, Paul Cannon was the PD and did the afternoon drive time. We played good old country music. I left to come to my hometown of Fort Worth on KBUY and was told later that when the ratings came out Paul was number one in the afternoons and I got number one in the mornings. Guess if I'd known that I'd have stuck around a little longer. I did enjoy my time at KTOW and in Tulsa. Retired now, I do a little preaching here and there. Comments: Many media people who come here will remember Mel Root, a nice guy who worked as a Tulsa World photographer for a couple of decades, then ran a photo business in the years since. Mel died this past Wednesday. No detailed obit yet in the paper, just the thumbnail death notice. In checking the Tulsa World archive, I found an article from this past May which recounts a dream vacation he took this year after learning he had cancer. Here's the link: "Long boat trip offers a chance to reflect", 5/25/2008. Here it is. Check out the electrical explosions. Gary Chew just reviewed "Burn After Reading", the new Coen brothers movie with Brad Pitt, Frances McDormand, George Clooney and John Malkovich. It looks like a really funny one. He will talk about it on the Friday KVMR evening news at about 8:50 pm Tulsa time. He was on the Peter B. Collins show Thursday. The show is downloadable from the archive; Gary appears at 2 hrs, 54 minutes into it. Comments: My sister and I seem to be the only ones to remember this. Actually, we don't remember too clearly, but it's driving us nuts, amazingly. During this song, we remember seeing footprints on the floor, but it never showed the animal. Can anyone help solve this mystery for us? Comments: The job market is bad up here in Chicago and I am working part time in a Wolf Camera chain store. Learned yesterday that my manager, Anthony, used to shoot publicity stills for some WGN radio shows. And hang out there some nights. One night a producer became very ill and asked Anthony to try to cover the phones till relief arrived. He did fine. He started filling in on the Ed Schwartz show as producer. He kept his day job managing camera shops. The current WGN radio overnight team (I forget their names!) had him as fill-in producer and 2 or 3 times a year put him on talking about new cameras and photography. Or talking about planning Florida vacations and Disneyland visits, his ex-wife lives there and he could almost be a tour planner for that neck of the woods. I asked why he didn't stay on for a staff job at WGN and he said, "They offered me full-time producing work, but I made more money managing a camera store!". Well, neither of us will be rich, working in a chain camera store! David Brinkley's "Washington Goes To War" is my all-time fave of Washington, DC books. I had given my initial copy away and after Brinkley died, they were in short supply then went out of print. I had to buy another copy from a used dealer on Amazon.com. Try to read it! It's great!! Comments: David Brinkley's Washington Goes To War: The Extraordinary Story of the Transformation of a City and a Nation (Knopf 1988) gives a lot of background to rationing. Brinkley confirms that gasoline rationing was done to save rubber. There was plenty of gasoline, but rubber supplies, both natural and synthetic, were very limited, due to the Japanese seizure of the Dutch East Indies and other parts of Southeast Asia. I have a "C" Mileage Ration sticker, the back of which reads "To Save Tires Drive Under 35. Share your car. Check air pressure weekly. Stop, start, turn slowly. Cross-switch tires regularly. Is This Trip REALLY Necessary?" Brinkley also states that most scrap drives were for morale-building, not for material. Often it took more effort to reclaim the scrap than it was worth, so it was just stored. He claims that as late as the 1970s, there were still a few U.S. government warehouses full of scrap aluminum (among other things), collected during WWII and never used. Comments: My good friend Jeff Ryan, son of Bill Ryan, asked me to submit something about his dad. Jeff, who still lives in Tulsa, supplied this information. William Augustin Ryan was born in Tulsa 7 February 1921, in the "brand-new" 3-story St. John Hospital. His father was Catholic, his mother Episcopal (from the Manget family of French Huguenot stock). He graduated from Tulsa Central High School in 1939, where he was a friend of future Tulsa TV personality Betty Boyd. He earned some college credits at the University of Michigan, then joined the U.S. Army in August 1942. Like all good Oklahoma boys should, Bill wound up in the 45th Infantry Division ("Thunderbirds"), where he trained in North Africa. Bill Ryan's first taste of combat was during the Allied invasion of Sicily, where he went ashore on 1 July 1943. After the Allies took Sicily, the 45th was in the thick of the invasion of Italy. Bill was wounded, recovered, and rejoined the 45th in time for the invasion of the Italian port of Anzio. A powerful German counterattack nearly pushed the Allies back into the sea, but the 45th stubbornly held their ground and earned a new nickname: "The Rock of Anzio." Bill Ryan received his second wound at Anzio. After recovery, Bill Ryan was transferred to the 1st Infantry Division ("The Big Red One") as an artillery forward observer. He went ashore with the second assault wave at Omaha Beach, survived, and went on to fight his way across France and into Germany. Bill was briefly captured by Waffen-SS troops before they were scattered by the Japanese-American soldiers of the 442nd Regimental Combat Team. Bill Ryan was awarded the Combat Infantry Badge, the Bronze Star, two Purple Hearts, and the French Croix de Guerre. He was discharged in November 1945, but continued to serve until 1949 in the Oklahoma Army National Guard as a 2nd Lieutenant with the 160th Field Artillery Battalion in Tulsa. About this time he changed his disliked middle name of Augustin to Michael. Also in 1949, he finished college under the G.I. Bill, with a BA in Radio Production at Tulsa University. Moving to South Carolina, Bill worked from 1950 to 1952 for the American Red Cross at the U.S. Marine Corps base in Parris Island. In 1952, he began his radio career at stations in Beaufort, S.C. In 1954, in Sanford, N.C., Bill met his future wife Lorane Grotke. Lorane was from the Buffalo, N.Y. area, and the couple soon moved there. About 1955, Bill Ryan began working for WKBW radio in Buffalo. Among the personalities he interviewed on air were former OSS director William "Wild Bill" Donovan (a Buffalo native), and Sammy Davis, Jr.
During one WKBW newscast, Bill Ryan was reading copy on air when a staffer began frantically waving from the control room, indicating that a hot bulletin was coming in. Another staffer raced into the studio with the copy in hand, only to slip on the newly-waxed floor. Falling onto his back, the man slid under the table where Bill was sitting. As he slid by, he handed the copy up to Bill, who snatched the copy and began reading without missing a beat, while the man on the floor slid by and crashed into the wall. In 1957, Bill Ryan returned to Oklahoma for good. He began working at Tulsa's KVOO radio at the studios on South Peoria. His frequent co-workers were Jay Jones and Johnny Ryan (no relation). Along with his extensive radio work at KVOO, Bill had some limited assignments at KVOO television, in news and various entertainment programs. Back in the days when local television stations exerted much control over programming, KVOO once hosted a "submarine movie" weekend. Staffers built a reasonable-looking submarine periscope and hung it from the ceiling down in KVOO's boiler room full of pipes, gauges, and valves. Bill Ryan and a few others donned plain khaki shirts and slacks similar to that of the U.S. Navy's World War II submarine crews, and portrayed the part of submariners at war while KVOO cameras rolled. These clips were used to introduce the movies KVOO aired that weekend. Bill Ryan: "Where were you on June 6, 1944, Jay?" Jay Jones: "I was in the hospital, cheering them on! [Jay had lost both legs at Anzio.] Where were you, Bill?" Bill: [In a dry, matter-of-fact voice] "I was on a landing barge, with seasickness compounded by fear!" About that particular radio conversation, Bill's son Jeff says it "got quite a favorable, humorous response in and around Tulsa." Bill and Lorane had four children: Jeffrey (born 1956, currently living in Tulsa); Stephanie (born 1957, currently living in Broken Arrow); David (born 1958, currently living in Friday Harbor, Wash.); and Matthew (born 1961, currently living in Tulsa). Lorane was an elementary school teacher for many years, as well as a school librarian, for the Tulsa Public Schools. She taught in Mitchell, Alcott, and Lanier Elementary Schools. Bill Ryan left KVOO in 1964, moving to KRMG for a couple of years. He then worked at a radio station in Vinita from 1967 to 1968, then in Claremore at KWPR from 1969 to 1970. For the next three years he worked in hotels in downtown Tulsa. Bill Ryan died of congestive heart failure on 2 December 1973. We appreciate you telling us the story of this American hero and Tulsa media man. Comments: The Durante equivalent to "What a revoltin' development" was "a catastastroke!" Comments: Jim, it was me who told about the guns being buried in England. As you pointed out about there being no shortage of gasoline in America, the reason it was rationed was because of a rubber shortage. The Japanese controlled the Asian rubber supplies we had been using, so that only left Brazil to supply us. ALL of the jeep tires and many of the other military tires made during WWII were synthetic (a trick we learned from the Germans the 1930s). Special gaskets, aircraft oxygen masks, gas masks, medical equipment, rubber stamps for office use, glues...etc, needed real rubber, so they took priority. Gasoline was rationed to keep people from wearing out their tires which contained real rubber. Comments: "What a revoltin' development this is", didn't Sylvester the cat say that too? I had, for my first radio, one of those cubes that you could put pictures into. It was all the rage back then. My second transistor radio was all white plastic, with a black band between the front and back. I accidentally left it outside during a rain, and it didn't work for a few years. What a long drought for music. KELi was certainly my fav. I started working with Mapelton Communications in May of this year. I just missed the business too much. They purchased Citadel's Spokane cluster of stations last year in that deal Citadel made with the affiliate CBS stations. I am doing sub work for them. I'm their "utility" guy I guess. I anchor the AM news block for KJRB when Larry Weir wants off as well as sub-in for any or their seven stations as announcer. I also have the weekend gig for "Spokane's Country 93.7 The Cat". I also own the Coeur d'Alene Coffee Roasting Co. Our coffees are distributed by Sysco Foods of Spokane. You can find some of what we have at. I am in the process of building this site, but our biggest sellers are available there now. Comments: Frank Morrow noted that the Brits were deficient in scrap conversion and another (sorry, I don't remember who) related that Americans sent guns to England which were buried. About that I can't comment. I do recall, however, that in his memoirs, Harold Ickes, father of Hillary's pal, and who had headed the War Production Board, or one of those bureaucracies of the day said that despite the fact that Americans were subjected to gasoline rationing and a 35-mile-an-hour speed limit, there was never a shortage of gasoline in this country, but that transporting it was the problem. Hence, some old timers may recall, the "big inch" pipeline that was started during the war but not completed until after. Archived GroupBlog 272 . . . . . . . . . . . . . . . . . . . . . . . . . . . . . . . . . . . . . . . . . . . . . . . . . . . . . . . . . . . . . . . . . . . . . .